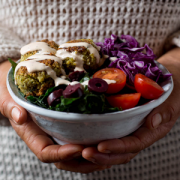 Buddha bowls are one of the latest foodie trends and we’re totally feeling it. To celebrate the fall, we’re bringing you this Fall Buddha Bowl w/ Cashew Red Coconut Sauce. It’ll be the comfiest meal to come home to during a chilly fall day. And what’s best- the rich, creamy coconut sauce driz finish will give you all the feels. Buddha bowls go by many different names, but essentially they are made up of vegetables, whole grains or carbs, and protein. They’re such a simple and fun way to put together a balanced meal. Ya’ll know how much we love the MyPlate method (refresher: 1/4 of the plate (or bowl in this case) carbs, 1/4 of the plate protein, and 1/2 of the plate non-starchy veggies). 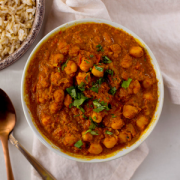 Today we’re using butternut squash as our carb, garbanzo beans as our protein, and cauliflower as our veg. Yes, the combination is glorious. This bowl is loaded with nutrients. Butternut squash is packed with vitamin A and vitamin C, which is perfect to boost that immune system for this fall season. The cauliflower also brings an added dose of vitamin C and vitamin K to the table. Let’s get started by preheating the oven to 425F. 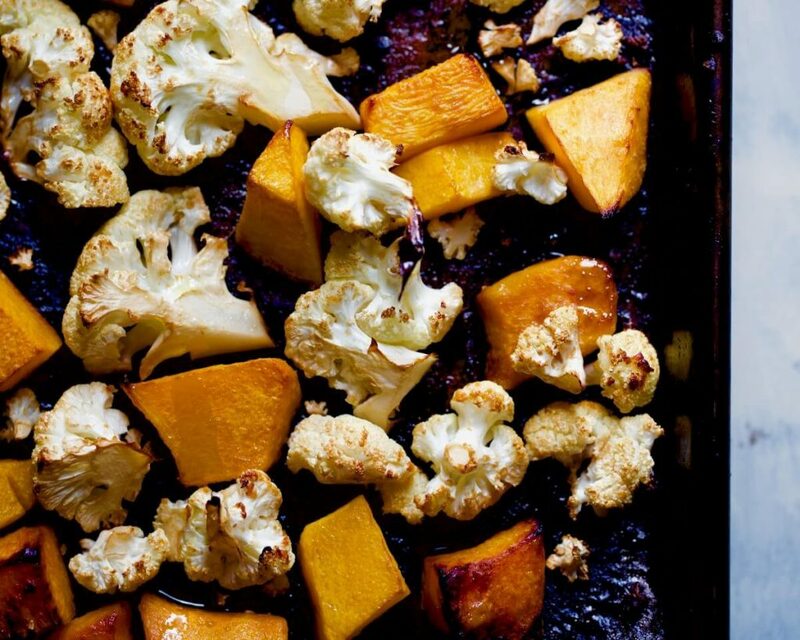 Add butternut squash and cauliflower to a parchment paper-lined baking dish. In a small bowl, add olive oil, tamari, maple syrup, white rice vinegar, and whisk together well. Pour this mix onto the squash & cauliflower, and using your hands, massage it in well until all pieces are covered. Bake for 25 minutes or until golden. Add the roasted vegetables into 2 bowls, add 1/2 cup of chickpeas to each bowl, & cracked pepper to taste. Set aside. Now for the sauce, blend all ingredients, and pour it onto the 2 bowls. 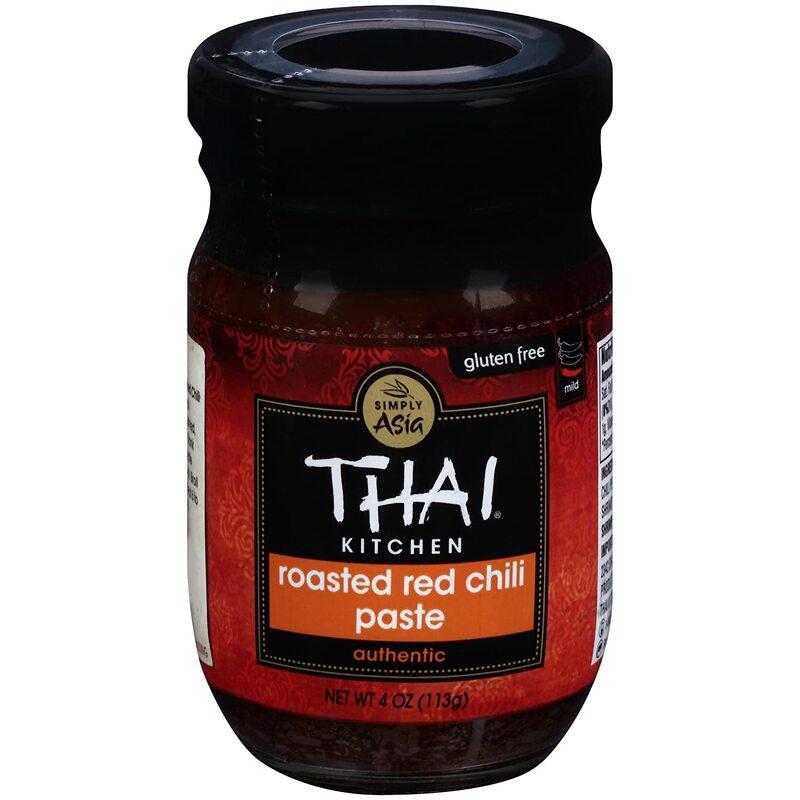 (For the Thai red chili paste, we used this product). Mix in with a spoon, and enjoy! What are you favorite ways to prep buddha bowls? 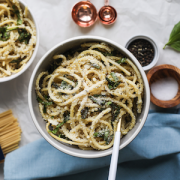 The beauty is that they can be made with any combination of your favorite foods and make for a quick and convenient lunch or dinner throughout the week. Drop us a comment when you try this Fall Buddha Bowl w/ Cashew Red Coconut Sauce out! Now for the sauce, blend all ingredients, and pour it onto the 2 bowls. Mix in with a spoon, and enjoy! I cooked this, loved it and will make it again 🙂 thank you for the recipe. YAY! That makes us so happy to hear! This looks great! I can’t wait to try it. By the way, do you know why these types of recipes are called “buddha bowls”? Is there any history behind it? Thanks for the reply and article link! I was curious if there was any roots to the term in Buddhism or otherwise. There are many kinds of buddhas, but they generally referred to as “the enlightened one”. I was hoping that the term originated in Buddhist traditions, but it doesn’t seem to be the case. I found this link on Epicurious that was also about the origins of the Buddha Bowl name.